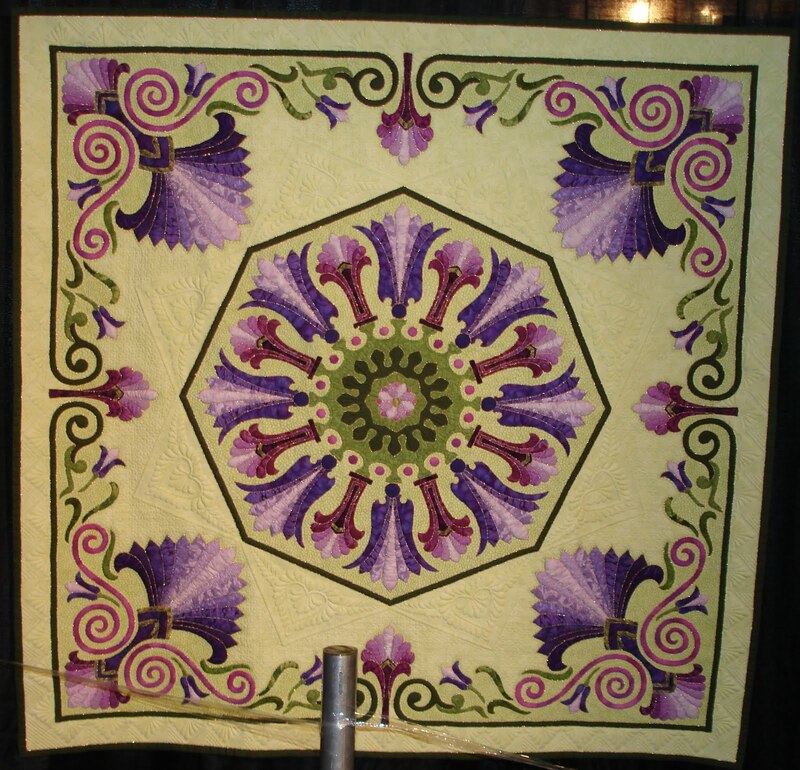 Over the years, as I participated in the quilting world ~ as a student and a quilter ~ I was always amazed by the interesting stories quilters shared about themselves and/or the quilts they had made. Walking through the International Quilt Festival in Cincinnati gave me an opportunity once again to read and hear quilters’ stories. 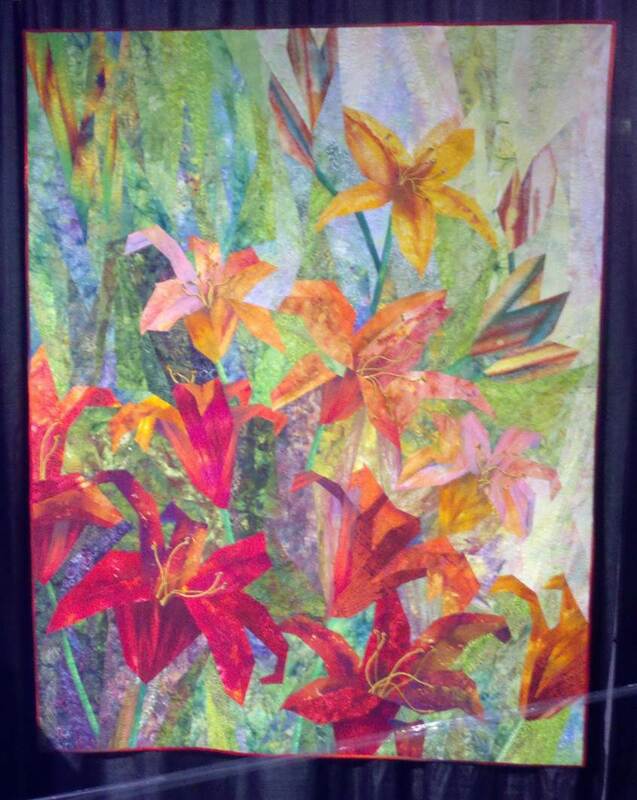 One exhibit showcased Baltimore Album Quilts made by quilters from across our country. They were all exquisite! Alas, no photos were allowed. However, I have been able to find some pictures here. Some of these quilts were made by groups and quilt guilds with members making individual blocks that were then sewn together. One quilt was the work of a teacher who said her goal was to make a Baltimore Album Quilt once she retired. She retired and it took three years to complete but the result was one she had to feel a sense of accomplishment in having completed. It was a sensational quilt! Another quilt in this collection focused on the state of Texas with small symbols representing that state and still another focused on the state of New Mexico. 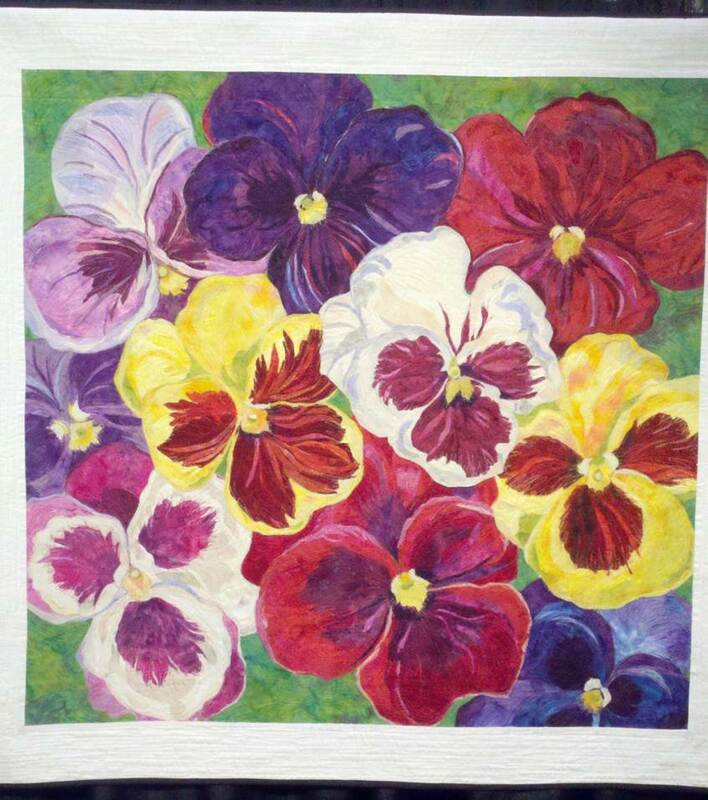 It was completed in memory of the quilter’s son who passed away as she was completing it. 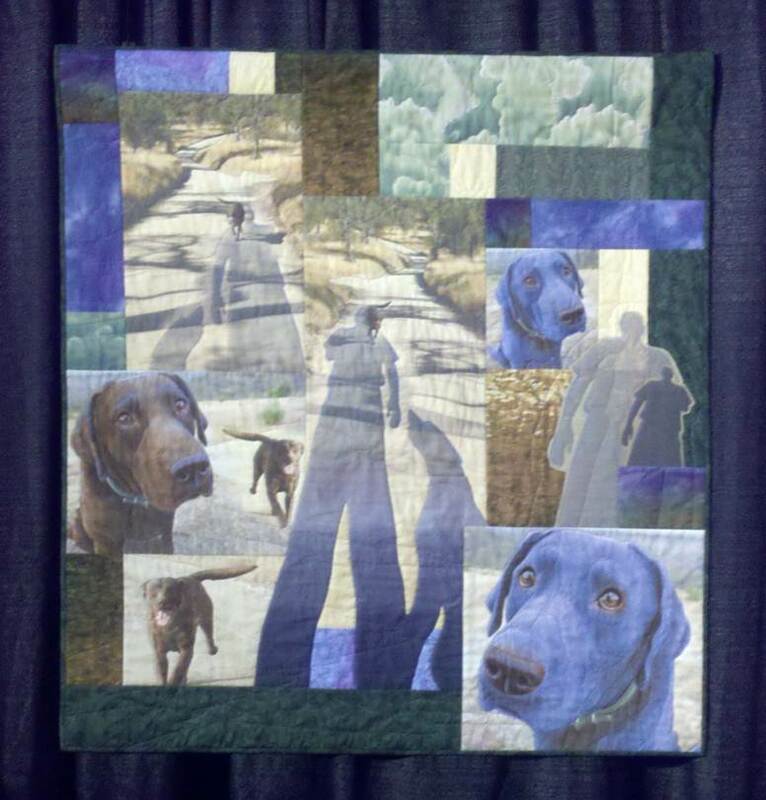 The little items that she added like their dog lying under a tree in the center of the quilt made it particularly touching and lovely! The most poignant story was attached to a beautifully finished Baltimore Album Quilt completed by a North Carolina quilter. 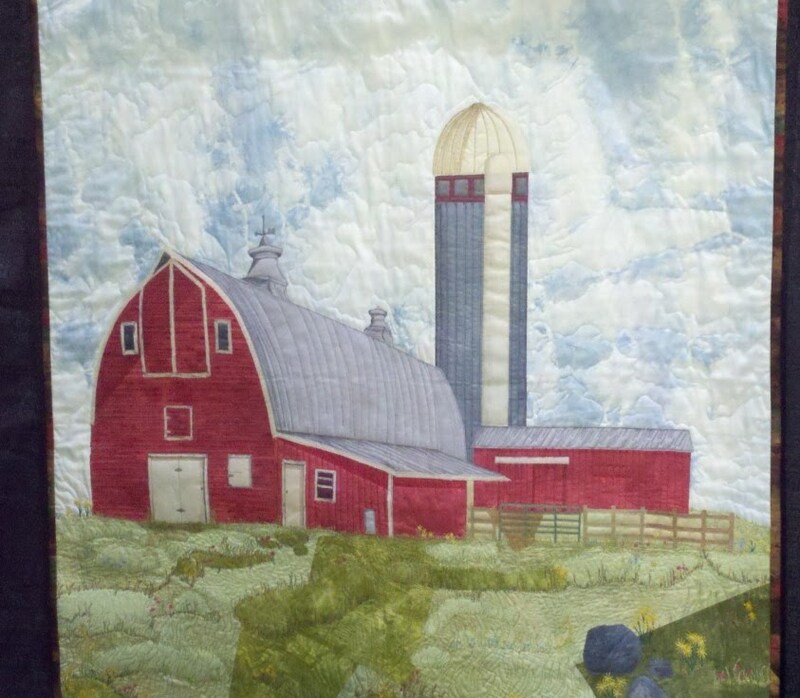 Her husband spent years driving here around North Carolina to purchase fabric for this quilt. Then he was diagnosed with cancer. His wish was to see her finished Baltimore Album Quilt before he died which came true shortly prior to his death. 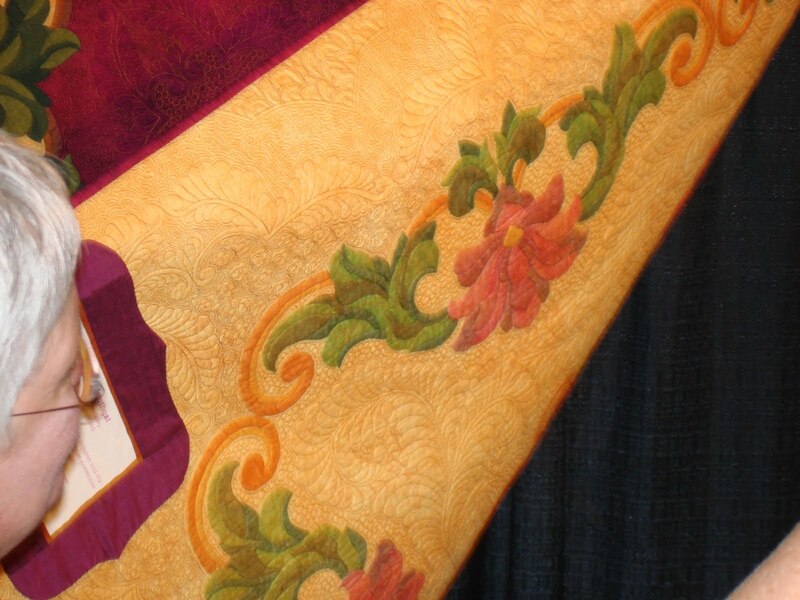 What a wonderful tribute to her husband and how generous of this quilter to share not only the quilt but the story with all of us who were lucky enough to see it at this Festival. 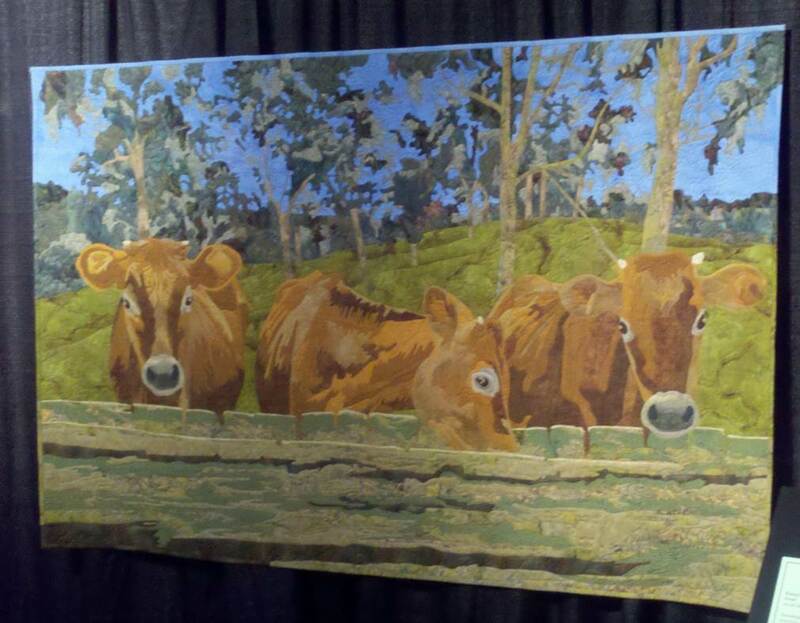 We hope you will enjoy two more pics of quilts on display at the International Quilt Festival. Will share another story next time actually told to me by a quilter while I was sitting “taking a breather” in the afternoon. 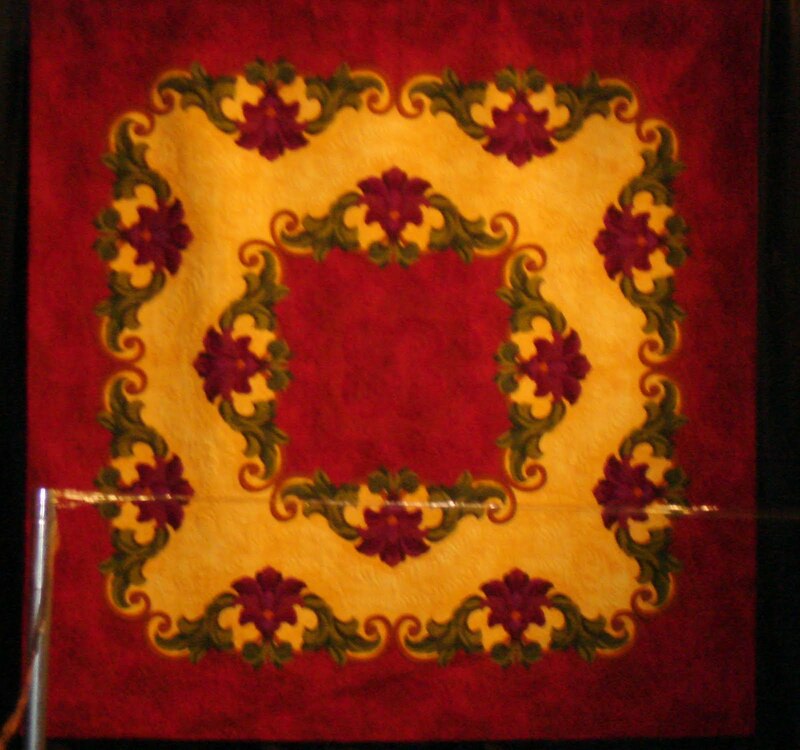 The quilt’s colors (above) were created using colored pencils. 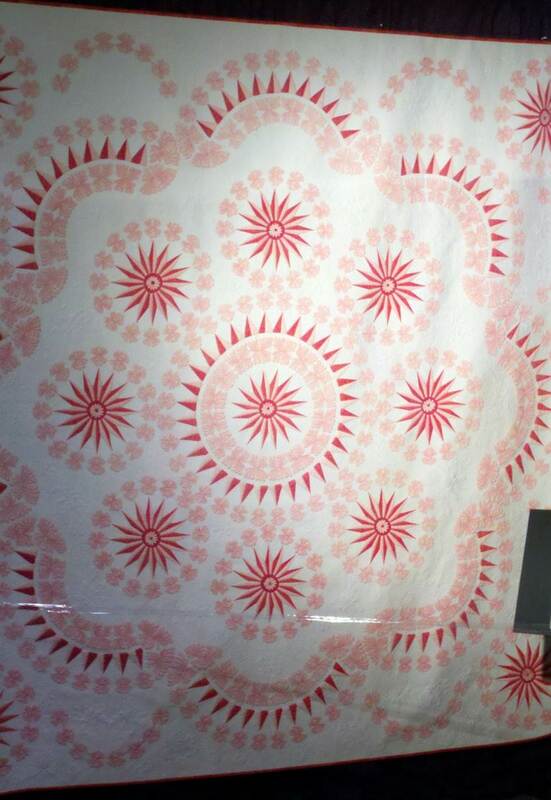 The quilter colored on the white fabric once the design was stitched. Amazing! 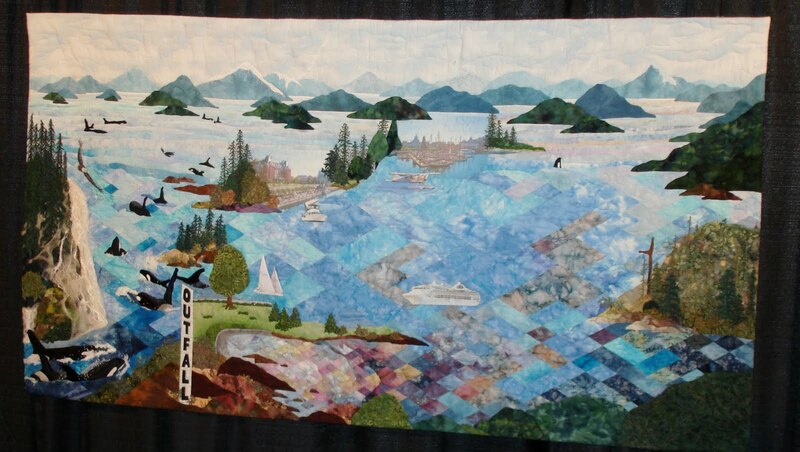 Do you see the Orca whales in the quilt above? 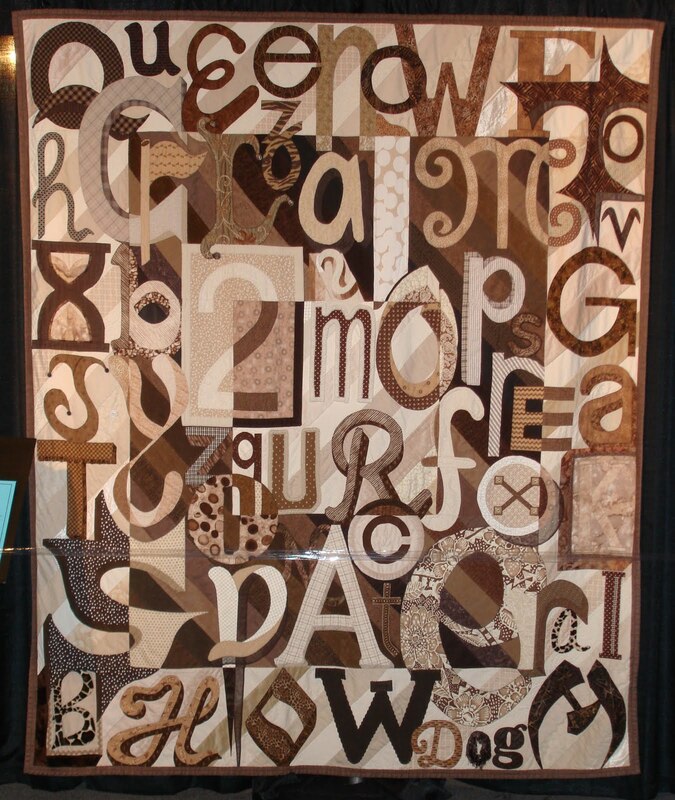 How many words can you spot in the quilt above? The last two pictures above are the same quilt. 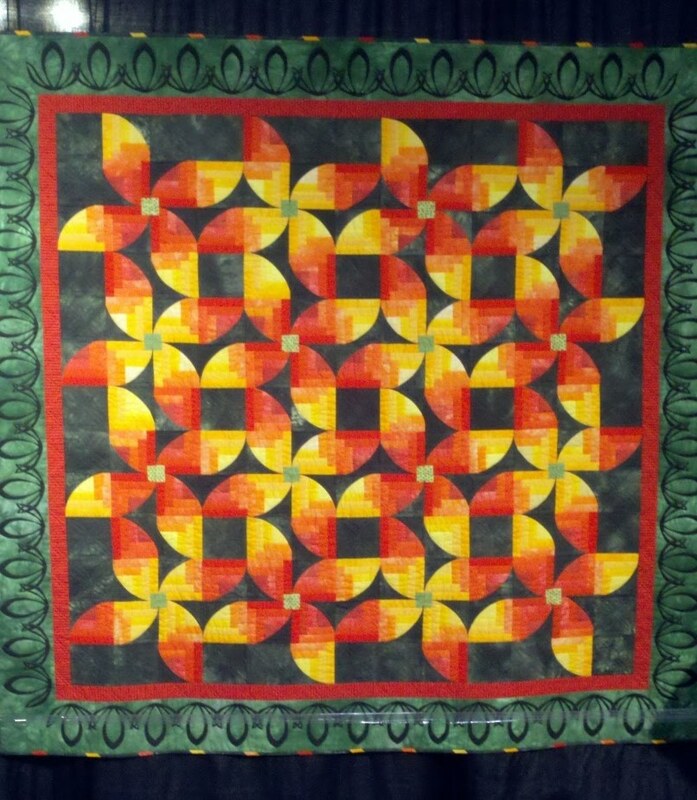 The designer created a design on the back of her quilt to give it an extra punch. Hope it’s not too rainy in your neck of the woods! Happy Easter and Happy Spring!